Peoples Democratic Party (PDP) president Mehbooba Mufti called for immediate rollback of the decision taken by Governor SP Malik-led state administrative council (SAC). Former chief minister Mehbooba Mufti on Saturday criticised the decision to treat Jammu and Kashmir Bank as a pubic sector undertaking, saying it "smacks of attempts to fiddle with the basic character of the state's special status". The Peoples Democratic Party (PDP) president called for immediate rollback of the decision taken by Governor SP Malik-led state administrative council (SAC). She alleged that "assaults on multiple fronts" were being launched against Jammu and Kashmir's special status and the administration "is taking away" autonomy of institutions that the state enjoyed. "The J-K Bank is part of this game plan and this was the reason PDP came together with the National Conference and the Congress to form a government and prevent such interventions," she said in a statement. "The Governor administration is taking such decisions which smack of attempts to fiddle with the basic character of the state's special status," she said. 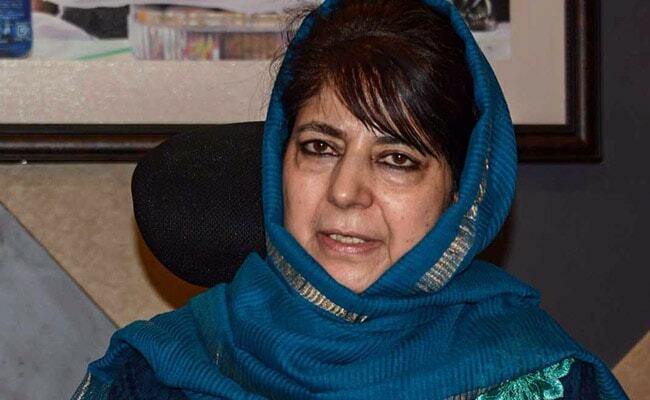 Ms Mufti said the Governor's rule in the state is not a permanent arrangement. The administration must concentrate on day-to-day functioning of the state and desist from taking decisions of far reaching consequences, she said. "Such actions raise apprehensions among the people of the state," the PDP chief. She alleged that attempts by her party at government formation were "undemocratically" foiled by the Governor, and asked him to review his decisions and roll them back at an earliest. The PDP chief said it is not for a set of bureaucrats and civil servants to take decisions of far reaching consequences in the state. "These things have to be left to a democratically elected government in Jammu and Kashmir. The Governor is not mandated by the people of the state to take such decisions," the PDP president said. Her reaction came after the SAC, which met on Thursday evening under the chairmanship of Governor Satya Pal Malik, approved the proposal for treating the J&K Bank Limited as a Public Sector Undertaking (PSU). The bank has been brought under the purview of the Right to Information (RTI) act, the Chief Vigilance Commissioner (CVC) guidelines and the State Legislature, an official had said Friday. Being the major shareholder, the government felt that the bank should have a character of a PSU which is subject to general supervision and access for enhanced transparency in the transaction of its business to promote public trust, the official had said. The purpose of the SAC's decision was not to question the day-to-day activities of the bank management but a step towards strengthening corporate governance, he had said.